To improve patient outcomes for people undergoing surgery. Using intense customer focus, daring innovation and business excellence, we will make Mizuho a recognized global supplier of operating room capital equipment. R.E.S.P.E.C.T. in everything we do. Responsibility – We are responsible for delighting customers, fellow coworkers, and our suppliers by building trust through integrity, accountability, and responsiveness. Empowerment – We empower our people to improve the quality of customer’s experiences, our products, and our systems. Stewardship – We work to improve patient outcomes and the health of communities around the world. Passion – We choose to perform our roles with integrity, enthusiasm, pride and professionalism. Excellence – We are dedicated to be the best in our industry. Commitment – We are committed to delivering the best services and products, focusing on what is important, continuously improving, and leading by example. Teamwork – We respect the contributions of each team member and succeed by listening and cooperating with each other. We are a U.S. based company founded over 30 years ago and are the leader in the specialty surgical table and patient positioning markets. Mizuho OSI is part of an international company, Mizuho Co., Ltd. of Japan, who has more than 90 years of proven innovation in the medical device area, making us a truly global organization. We share a responsibility and commitment with our healthcare partners to provide cost-effective and innovative solutions that effectively meet the needs of all the surgeons who use our products. Mizuho OSI continues to collaborate with world class surgical and patient care thought leaders to ensure our products produce the most favorable patient outcomes possible. Our extensive innovative product portfolio and extraordinary services position the company to attract and maintain long relationships with our customers. On behalf of our employees, I invite you take a few moments to explore our website and learn more about Mizuho OSI. • The Company, founded in 1978 by the Moore family as a medical soft goods company in Hayward, California, was known as Orthopedics Systems, Inc. (OSI). Among OSI’s early products were orthopedic soft goods including splints and braces. • The first OSI operating room product, the Andrews Spinal Surgery Frame, was developed in collaboration with Dr. E. Trent Andrews and introduced in 1980. • During the 1980’s, the company developed and produced many products relevant to orthopedic fracture surgery, spinal surgery and sports medicine, including knee arthroscopy, ACL repair and shoulder arthroscopy. • In 1992, the Spinal Surgery Table was introduced by OSI. The table featured the first use of carbon fiber composite materials in the structural members of an operating table. This construction allowed nurses to easily manipulate the table and provided a radiolucent surgical platform where x-rays could pass through the table to provide a clear image of the patient. In 2008, Mizuho OSI introduced a more sophisticated version of this product, the Axis Table System which achieved immediate success. • During 2001, collaboration began with Dr. Joel Matta of Santa Monica, CA for development of a surgical table for use in trauma procedures, leading to the production of the PROfx® Trauma Table in 2003. The table also enabled orthopedic surgeons to perform the Anterior Approach Procedure for hip joint replacement. The anterior approach for total hip arthroplasty is a revolutionary method of hip replacement leading to fast recovery and improved stability. • In 2002, OSI was acquired by Mizuho Ikakogyo Co., Ltd., in Tokyo, Japan. • Today, Mizuho OSI offers a wide variety of highly specialized surgical tables for spinal, hip replacement, knee replacement and orthopedic trauma surgery, as well as tables for comprehensive imaging required in today’s minimally invasive procedures. 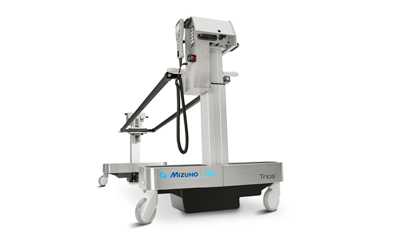 • Mizuho OSI is also the nation’s second largest supplier of over-bed traction equipment and offers an extensive line of patient care and pressure management products to hospitals and clinics around the world. • Mizuho OSI products are sold in the U.S. through direct sales representatives and worldwide through authorized international distributors.